When in search of DIY Christmas decor, we always seem to find ourselves just a little bit short on time. With the holidays close by and budgets that keep getting tighter, it's time to make stellar decorations out of what's already in our homes. It's true -- every Christmas decoration you need is already. in. your. house. Rejoice! We've compiled a Pinterest board of our favorite DIY decoration projects, which use around-the-house standbys from cake stands to serving trays to even your own front door. With a sprinkle of holiday magic, the items you already have can easily double as the only decorations you'll ever need. 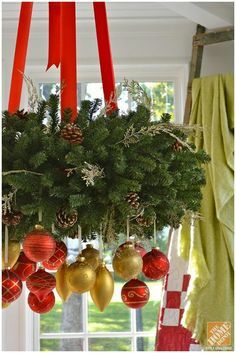 THE CHANDELIER: Hang mismatched ornaments from your chandelier with both wide and skinny ribbons to achieve a look that's whimsically festive. Or wrap the chandelier with leafy garlands... or do both! 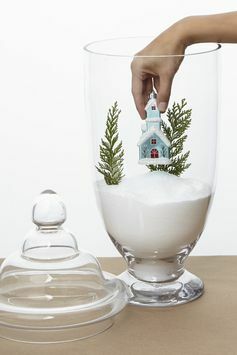 TALL JARS & VASES: Martha Stewart's signature holiday project involves dusting tall, glass apothecary jars with a layer of salt or faux snow, then arranging ornaments or tiny figurines inside. It's a design-your-own, grown-up snow globe, if you will. 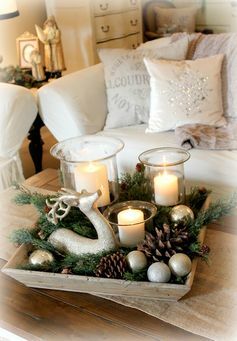 SERVING TRAYS: Spruce up your appetizer platter (literally) with festive-looking ferns, glowing candles, branches or glittery accents. The more trinkets, the merrier! YOUR FRONT DOOR: Turn your regular entryway into one big gift. 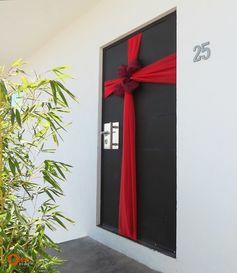 Wrap it with an oversized bow to welcome guests, or do the same with a living room door to make the Christmas morning reveal more special than ever. 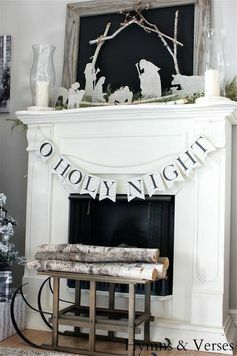 YOUR MANTLE: Chunky statement candles, a DIY wreath, an evergreen garland or a string of pennant letters will turn your regular fireplace into the centerpiece that Christmas-ifies an entire room. Just add stockings! 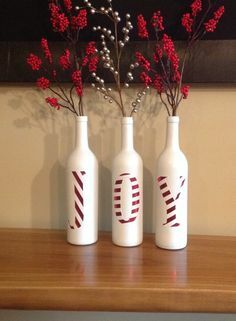 RECYCLED WINE BOTTLES: Empty your recycling bin, and add a pretty coat of paint to empty wine bottles to make a set of brand-new vases. Draw letters to spread messages of holiday cheer, and arrange twigs or holly inside.